For three decades, the Wurlitzer building in Detroit’s Broadway Street – which Robert Finn had designed in 1926 to house the family’s musical inventory – lay abandoned, a somewhat wistful metaphor for the city’s fortunes. But now, things are looking up again. A block away, Woodward Avenue teems with interesting boutiques whilst the new Q-Line streetcar links the area to the Detroit Institute of Art and other midtown museums and galleries in minutes. 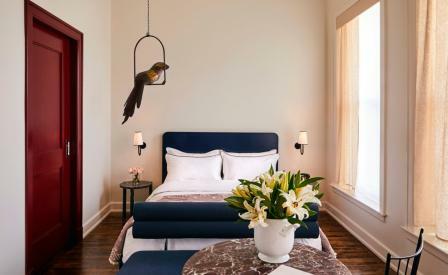 Amidst this quiet rejuvenation, the Wurlitzer building has been refashioned by ASH NYC into a warmly furnished 106-room boutique property. Its mood becalmed in timber floors, white veined black marble, hues of pinks and oxblood, and plush angular furniture framed with shiny chrome, the retro-modernity of the whole is nicely balanced by the building’s original plaster detailing, travertine floors and terracotta signs. Unusually for a hotel so small, there are ten retail, food and beverage outlets, including a cocktail bar and an eight-seater tasting counter offering zhooshed up Great Lakes cuisine (think, rutabaga cooked in schmaltz and cream of onion and buttermilk, and peaches frozen with thyme), alongside a barbershop, florist, and a 14th floor rooftop bar that looks clear into Canada across the Detroit River and, baseball buffs rejoice, into Comerica Park’s centre-field.